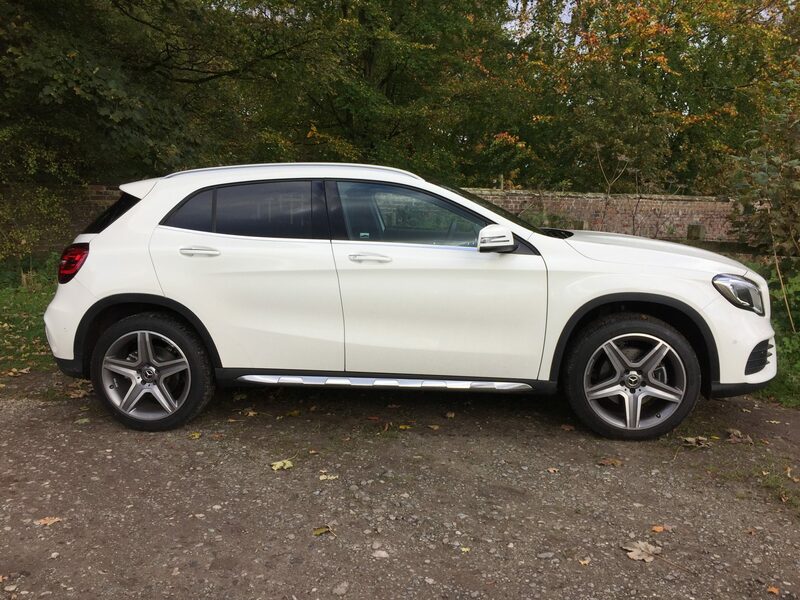 The Mercedes GLA was launched in 2013 & was recently updated in 2017. Based on the A-Class, it’s a compact premium Crossover which offers a bit of class. It competes with the likes of the BMW X1, Audi Q3 & Range Rover Evoque. Before Mercedes-Benz launched the A-Class, it could be argued that the brand had stagnated, especially with design. However, taking it’s cue from the supercar Mercedes SLS, the Daimler designers were able to impact a little bit of fairy dust onto the A-Class, which became the first MB model in a new production line, that has seen all of MB’s main fleet models, the C, E & S-Class, as well as the rest of the model range, come right up to date & compete head to head with it’s main corporate rivals BMW & Audi. Indeed MB have smashed their fleet sales performances year on year, with the updated & improved model range one of the major reasons why. Compact Crossovers are in Vogue. Nissan’s Juke started it & everyone else has followed suit. Mercedes version is the GLA which is basically an A-Class hatchback, with attitude. It’s slightly larger than the A-Class & comes with a more aggressive look. The 2017 revisions include modified bumpers, smarter alloy wheels & the option of full-LED headlights, plus all models come with off-road comfort suspension which raises the body up by 30mm, but in truth, it doesn’t look that different from the launch model. There are both petrol & diesel choices for customers. The petrol GLA 200, which features a 1.6-litre turbo four cylinder engine, is followed by the 2.0-litre turbo GLA 250, which also features 4MATIC 4WD, with the petrol range topped off by the high-performance AMG GLA 45. The diesel range offers two choices. The GLA 200d & GLA 220d both of which use the same 2.1-litre four-cylinder engine, but the latter is more powerful and comes with 4MATIC four-wheel drive as standard which is optional on the GLA 200d. Both have six-speed manual gear boxes as standard. 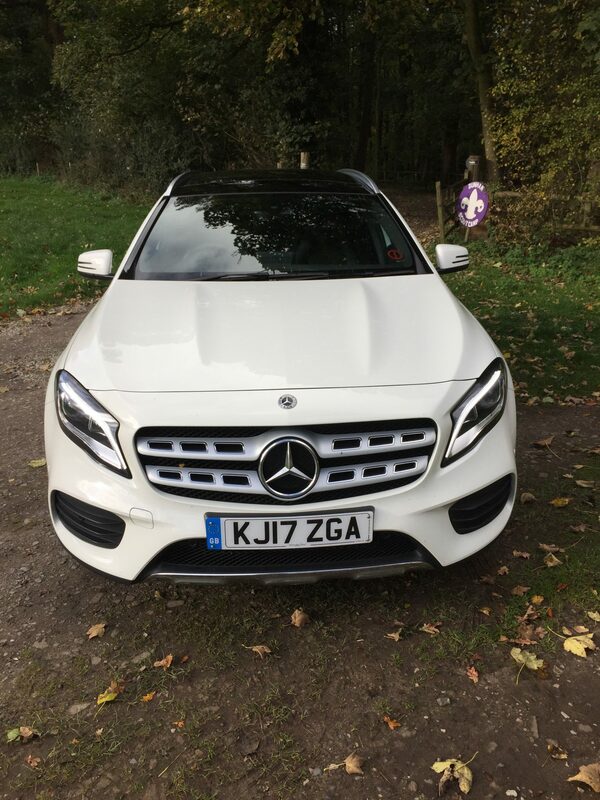 There is a seven-speed DCT auto on offer as well, which just happened to be the gear box fitted to our test car, which was a GLA 220d 4MATIC AMG Line. Trims for the Mercedes GLA comprise SE, Sport & AMG Line, while the AMG 45 is the performance model of the range. Mercedes offers a variety of upgrade packs called Executive, Premium & Premium Plus, which add kit for a more reasonable cost than simply adding options individually, something we would recommend buyers consider. big air intakes, there are wrap around headlights, bulging wheel arches & aluminium roof rails, all of which combine to give the GLA an aggressive stance. Inside the cabin, much is the same with the five cross air vents, centrally located infotainment screen, 8” on our test car, which is controlled by a rotary dial located in the transmission tunnel-it’s not a touchscreen-.Additions include, higher quality seat coverings, smarter trim finished with chromed control panels & re-styled instrument dials. 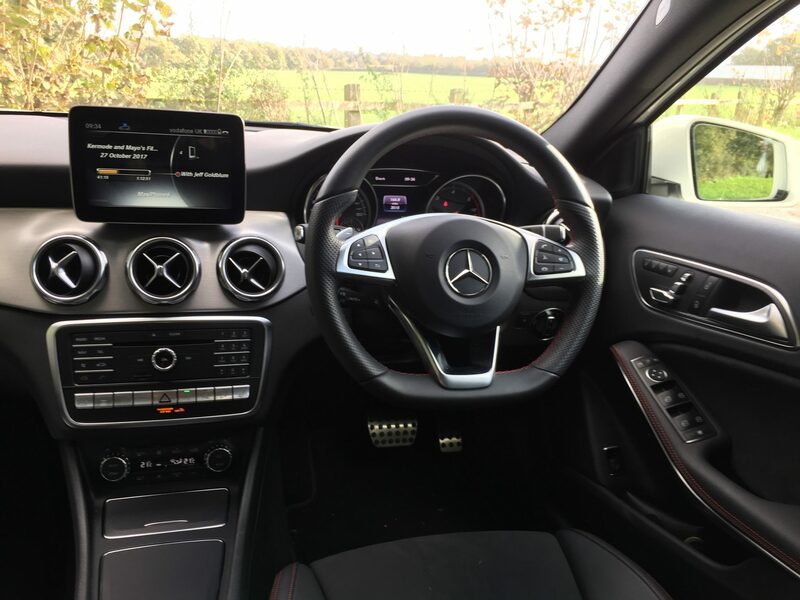 You are sitting 80mm higher in the GLA than the A-Class which gives the driver a commanding view of the road ahead. Both front seats offer multiple adjustments via the door buttons & there is also plenty of leg & head room up front as well. Rear passengers aren’t as lucky. The dark cabin, large A pillars & sloping roof, all combine to make the car feel a bit claustrophobic. Two adults will sit happily in the back, but it’s not great if you need to carry five. The GLA has a decent boot, which offer’s a pleasing 481 litres, which is more than the Q3 & Evoque & only 29 litres below the X1. Fold the rear seats down & this useful space increases to 1235 litres. Standard spec on our AMG test model includes AMG body styling, front & rear apron & side skirts & aluminium roof rails. Inside, you get illuminated door sills, thermostatic luxury auto climate control, audio 20 with Bluetooth interface, the 8” media display with Apple Car Play & Android Auto, cruise control with variable speed limiter, reversing camera with a 180 degree view & 19” five spoke AMG alloys finished in titanium grey. Mercedes of old were not necessarily that well made. Rest assured though, because as with all of the brands current line-up, the build quality in the GLA is excellent. The plastics & finish used really are top notch & the overall ambience is good. From an infotainment perspective, we easily connected our iPhone to the media system. The SatNav is easy to use as is connecting to Apple Car Play. However, there is a major oversight. There is no DAB radio, which is an extra. And I do love DAB ! When you’re driving the GLA, similar to other Crossovers running on large wheels, the GLA doesn’t like pot holes or speed bumps & it tends to bounce around at low speeds. It’s better when you drive faster & across smoother roads & in the urban environment is excellent. Motorways miles are eaten up, the cabin is well insulated against wind & road noise & by utilising the adaptive cruise control fitted to our test car we made a couple of 100 mile journeys in total comfort. All versions of the GLA are safety conscious. The GLA comes fitted with Pre-Safe, which prepares you & the car for an impending accident; Attention Assist, which sounds a warning if the driver looks as though they’re about to fall asleep; & Collision Prevention Assist, which automatically applies the brakes if it detects an impending front-end collision. The GLA is on average 40kg heavier then the A-Class on which it’s based. This means that fuel economy suffers. 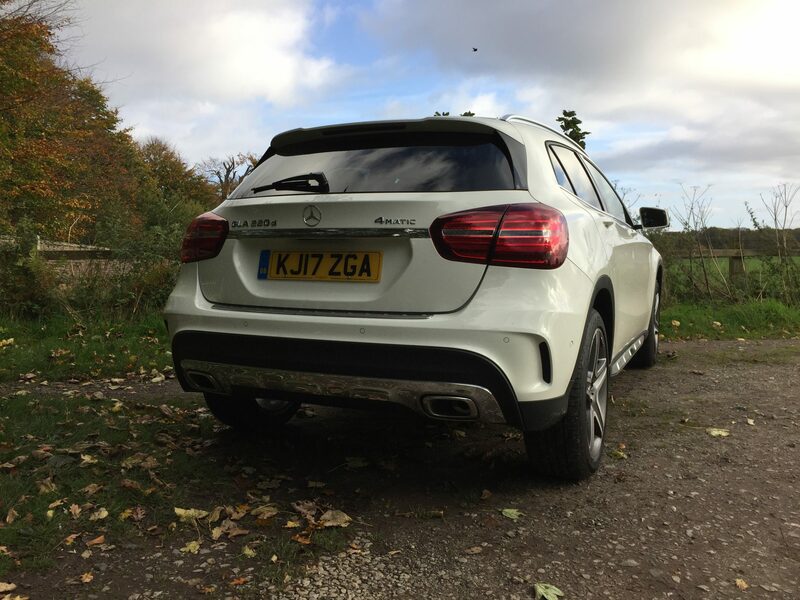 Our 400 miles or so in the GLA, saw us average a respectable 43.1mpg, when claimed combined is 58.9mpg. Emission on our test car were high as well, at 130g/km. We would suggest that the smaller diesel engine GLA 200d with the six-speed manual gearbox would make the most sense for fleet drivers, because it has better combined economy, a claimed 67.3mpg coupled with lower emissions of 110g/km. Both will save fleet customers money in the long run. In conclusion, if you must have a premium SUV, then the GLA would make an excellent choice. Spurred on by MB’s much improved build quality & reliability, the GLA offers customers just a bit more than the A-Class, as well as being the best looking car in it’s sector. The only negative we can see at present, is a lack of smaller petrol & diesel engines in the GLA range, aimed at reducing emissions & increasing fuel economy. These I believe are on there way, but otherwise all is well in Milton Keynes. As I write, MB have just recorded another record, with 182,812 vehicles sold in an October (+5.6%) it’s best October ever. Not only are Mercedes selling lots of cars, they are building better cars which are proving more desirable than ever before as well. Throw into the mix some competitive business contract hire rates & you can see why the brands aim to be the number one supplier in the premium fleet sector is becoming a reality.